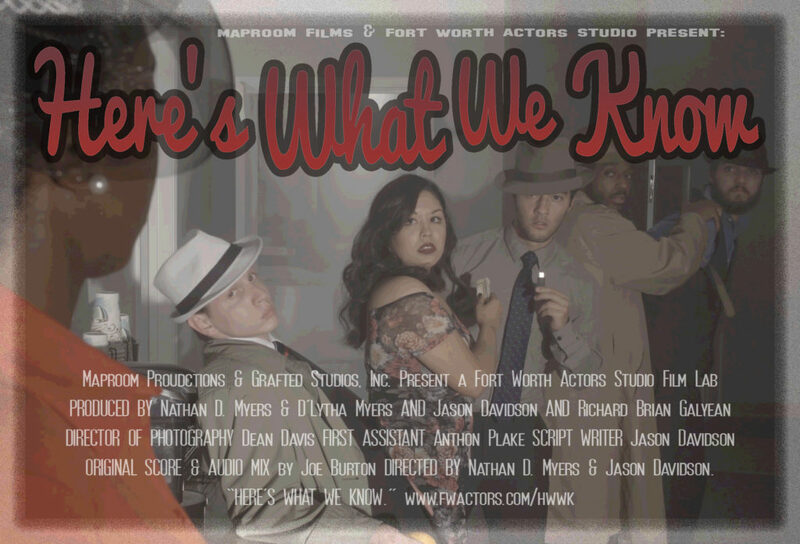 Here’s What We Know is a Ten Minute short film featuring the talents of several DFW Area Actors in cahoots with Maproom Productions and Fort Worth Actors Studio. It’s a campy, comedy of errors in a horror of an office. Written by Jason Davidson and Co-Directed by veteran Director Nathan D. Myers & Jason Davidson, Here’s What We Know will have you laughing and analyzing as imaginations run wild and heads roll. In the midst of Allen’s intra-office birthday party, a company owner’s attempt to cover up nefarious activity goes hilariously wrong. A thumb drive with incrimating information goes missing. Corporate cogs get investigated. And, Somebody’s going to jail. Here’s What We Know is being submitted to festivals around Texas and elsewhere. Stay tuned to this page for updates.